At the Thursday, February 2 special meeting of the Elk Grove City Council, a council vacancy was filled by appointment. After close to five hours of presentations by most of the 20 applicants seeking the appointment as well as public comment, Stephanie Nguyen was appointed to the District 4 seat. The seat was vacated in December, 2016 when Steve Ly vacated it upon his election to Mayor. 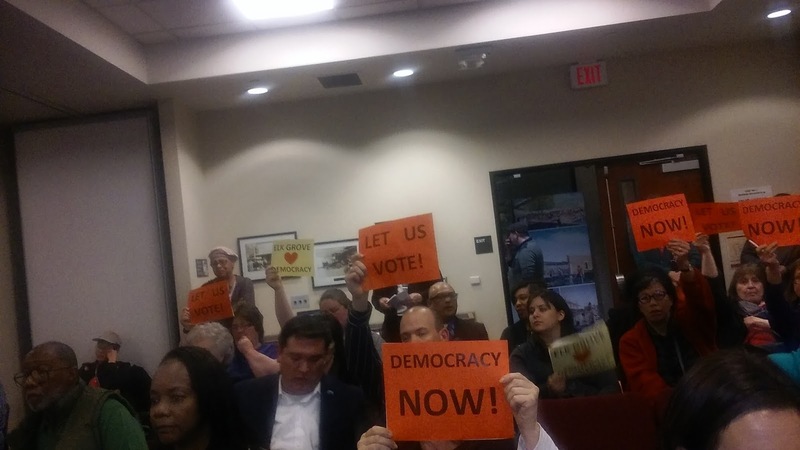 During public comment, over 20 people spoke with most of them urging the Council to hold a special election instead of making an appointment to fill the vacancy. Below is a video of some of the comments made. After a five month hiatus and input from readers, the comment section on EGN has been reopened. It is our hope it will lead to a substantive discussion on the topics and stories posted on this site. 1. There are no anonymous comments - you must have an account with Google or one of the four other services posted in the Open Id selection. 2. Please no use of vulgarity or ad hominem attacks, particular on non-public individuals. 3. Comments will be moderated prior to posting. It is our hope that thoughtful comments can lead to meaningful conversations and provide our readers a means to communicate their thoughts to our elected officials. On a separate note, we have heard from several readers that page load time is not as quick as desired. We have made some "under-the-hood" changes that should speed up page loading. We still have a few other changes, so with a little time and patience, page loading speed should improve. Thank you visiting this site!